DirectV has been recreating iconic movie moments in a series of television commercials. The one that has gained the most attention recently is the one with Chris Farley and David Spade in the 1995 movie Tommy Boy. Farley died in 1997, twelve years ago. That’s too recent for many of his fans who are upset about the appearance of Farley in what they call an offensive, tasteless and insensitive abuse of his memory. Chris Farley does his “Fat Guy in a Little Coat” bit for David Spade, whose dialogue has been re-recorded to promote DirecTV. “Great, I’m here with tons of fun, when I could be at home with my DirecTV … But no, I’m stuck with either cable or that (pointing to Farley). It never gets old.” It’s safe to say that it’s not the length of time since Farley’s death that is bothering his fans. It’s the suggestion that watching cable TV would be a better option than spending time with the star. The two Saturday Night Live stars appeared in Tommy Boy, with Farley playing the fat dim witted Thomas Callahan III and Spade laying his father’s assistant Richard Hayden. They have the challenge of making a success out of the auto parts company Tommy has inherited from his father. Online entertainment mag Asylum managed to get a response to critics from David Spade and representatives of DirectV, suggesting that Farley’s family were involved in the project from the start. In an earlier DirecTV commercial Craig T. Nelson reprised his role from the 1982 movie, “Poltergeist”, along with historical footage of Heather O’Rourke, who died tragically in 1988 at the age of 12. The DirecTV Tommy Boy ad was developed at Deutsch LA by executive creative director Michael Kadin, art director Ryan McLaughlin, copywriter Howard Hill, with agency producers Victoria Guenier, Dominique Anzano, Eva Ellis. 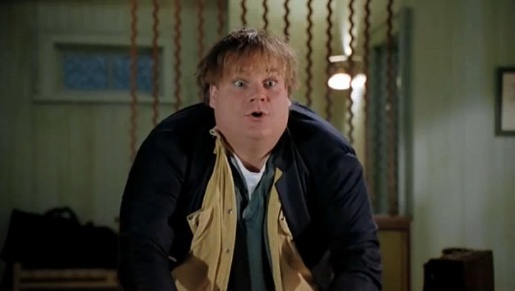 “Tommy Boy” was filmed by director Chris Hooper with producer Preston Lee at Uber Content. Editor was Lance Pereira at Chrome Editorial.